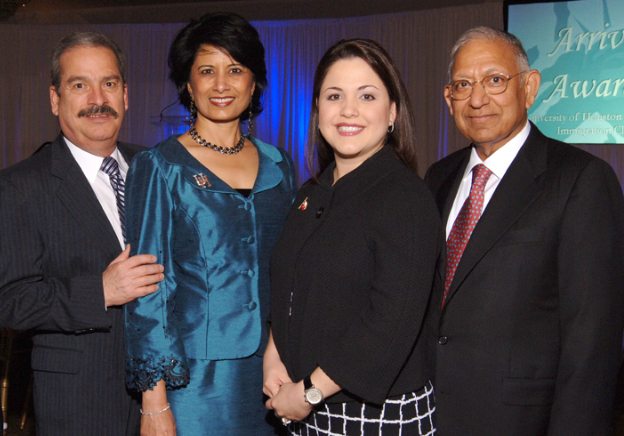 Nov. 17, 2011 – The University of Houston Law Center Immigration Clinic honored three noteworthy immigrants at the 2011 Arrival Awards program. Durga D. Agrawal, president and CEO of Piping Technology & Products, Inc.; Oscar Castañeda, president of Castañeda Maxillofacial-Dental and Associates; and Ana Hernandez Luna, a lawyer and state representative of District 143, received the 2011 “Arrival Award” at the event. Agrawal is a native of India while Castañeda is from Honduras and Luna from Mexico. The Arrival Awards recognize the successes and benefits that immigrants bring to the community and nation in general. Proceeds from the awards dinner benefit the UH Law Center’s Immigration Clinic which assists hundreds of immigrants and refugees who could not otherwise find legal representation. It also serves as a vital, hands-on teaching laboratory for aspiring lawyers. The event was held on Wednesday, Nov. 9 in the Crystal Ballroom of the Rice Lofts in downtown Houston. For more information on the Immigration Clinic, click here. President of the University of Houston and chancellor of the UH System Renu Khator (2nd from the L), a past recipient of the "Arrival Award," was on hand to celebrate with 2011 "Arrival Award" winners Oscar Castañeda (L), Ana Hernandez Luna, and Durga D. Agrawal.